According to a tweet from Adduplex's Alan Mendelevich, a new Nokia phone, heading to Verizon, was just checked out by the FCC. Adduplex, a cross-promotion network for Windows, recently tweeted about four new models that he believes that Nokia is bringing with it to Barcelona for MWC. Mendelevich's new tweet reveals an unknown phone with the model number RM-860 which he says has a resolution of 768 x 1280. 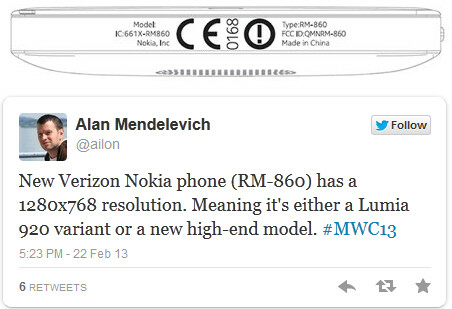 He says in the tweet that it is either a Nokia Lumia 920 variant for Verizon, or another high-end model. Further speculation has the phone supporting LTE bands 4 and 13, which usually are the hallmarks of an LTE enabled device for Verizon. All of these models have been showing up in Adduplex's logs. It turns out that a new variant of the Nokia Lumia 920 is expected to come to MWC code named Nokia Catwalk. This will be a thinner device than the Nokia Lumia 920 with an aluminum body. 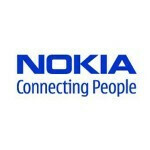 There also is another rumored new high end phone code named the Nokia Laser which is a Windows Phone model with the same 41MP camera sensor as seen on the Nokia 808 PureView. Both of these models are supposedly Verizon bound which means either phone could be the one at the FCC. How do we know that the model that Mendelovich tweeted about was at the FCC? Because a diagram of the device that came from the FCC revealed the same RM-860 model number that is mentioned in the tweet. Take a look at the diagram above the tweet in the picture that accompanies this article. So when is fhd coming to lumia phones? 41mp+fhd. Cool. Microsoft restrict using FHD as of now. MWC is 3 days away.... Tick-tock, tick-tock. Nah I am more excited about the samsung galaxy SIV on march and Motorola X on May. Whats exciting about S IV? They just upgrade screen and processor every year. It'll have 1080p over-saturated and dimmer-than-LCD screen with a new processor. And there is no way a samsung phone has a better design than even a low end lumia. Nokia, on the other hand, has excellent designs and cameras. Just have a look at leaked lumia 520 picture, its design is better than any phone released in samsung's history. The new high-end lumia is definately going to be better than S IV just like 920 was better than S3. The only thing that is holding nokia back is WP8's lack of support for 1080p screens. don't forget lack of great apps too. dude you have obviously never used a galaxy s device! The S3 is not just great hardware but it has a barrage of over 40 software optimizations not found on other devices which contributes to the total user experience! Its not great hardware or build that makes a great phone its the combination of hardware and software which makes the phone awesome....and baby Sammy delivers to the fullest in the Galaxy S package! Yeah by putting that hideous touchwiz bloat on it. No thank you. I'll take stock android any day. And Motorola over Samsung as well. I'll admit that on Windows Phone, there's less of the bloatware, which can tend to be a nice touch..
You may not feel that excited but there are millions who are excited for S4.. People talk about looks and build material but Samsung has proved that those attributes contribute very little in terms of sales..And 920 better than s3 is joke of the day.. I'll agree with you about that. The interesting and ironic thing is that I used to have a Galaxy S3. I loved it but I also have the Nokia Lumia 822 from Verizon, and well, I must say that the one of the many things I am loving about Windows Phone 8 devices is the hardware camera button for super quick picture taking even when the phone is completely locked up. I also enjoy the super fast shutter speed for fast pictures taking. The one other thing I do enjoy is, has anyone ever tried to record a 1080P HD Video with the S3 and send it out to someone? I mean sure you can S-Beam it, but that dictates that you're right next to that person. With Windows Phone 8, the OS will actually automatically compress that video so that you can send it out via email. Trust me, that's a sweet option. If Verizon gets the variant of the Lumia 920, I might just buy it for my personal line. I hear you in the video part, they look great on the phone only, when you try to watch the same video somewhere else like a computer or Facebook they look awful. I am curious to see if VZW users get to have some flagship WP8 love from Nokia. The L822 was basically a middle-fingered wave with the L920 being exclusive to AT&T. If Nokia announces a flagship phone with the huge camera sensor on VZW, and the ship date isn't too far out in the future, I might upgrade my GS III to the new Nokia (the Note II is staying, though; at least until the Note III drops). It won't be my primary phone, but I am curious enough about WP8 that I would get one if the value proposition was compelling. What Nokia are doing is sticking to their roots of making for the budget end, it's what makes up the bulk of their sales and their low ends happen to be very reliable and I can't wait to see what Nokia has up their sleeve for the Lumia 1000, rest assured that will be the show stopper for MWC amongst what is going to be a very underwhelming MWC 2013 show in my opinion. Wasn't necessary to bring in the S4/S3 for argument's sake when this article is talking about the low budget end with very respectable looking handsets. Each to their own I guess. How is the article talking about the 'low budget end'? Most of the article was devoted to the 2 phones on the high end. The 'budget' phones only got a passing mention. sorry, my mistake, i thought i was commenting on the Nokia 520 and 720 articles for a moment, duh! Fail on my half. why phonearena.com y not publishing nokia press release also.....oh this can hurt android and sammy? If nokia manage to become top dog again then they will publish.. Remember, currently nokia gets very little clicks compared to Sammy.. So websites have to play according to it..
Really hoping T-Mobile gets some Lumia loving too. Carrier exclusivity is baloney. Which processors support more than 20 MP right now?